During his long life (1909–1999) Archimede Seguso worked in many of Murano’s most important glasshouses, but ultimately he would become famous for founding and operating his own. At a young age he became an apprentice at Vetreria Artistica Barovier where his father was a partner. In 1933 he became a founding member and principal master blower at Barovier Seguso Ferro. Here he collaborated extensively with the young designer Flavio Poli and earned a reputation as one of the greatest master blowers on the island. 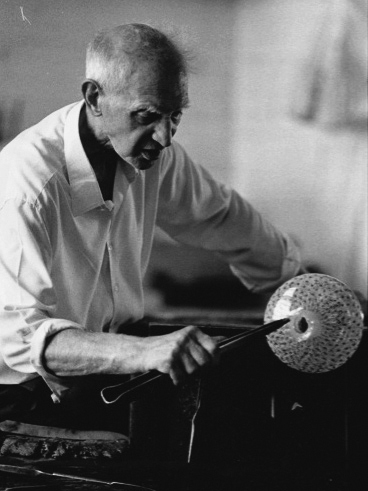 In 1946 he established his own workshop, Vetreria Archimede Seguso where he served as designer and master blower, personally executing almost every piece for more than 40 years. During this time he developed many innovative designs that employed complex ancient techniques, such as Filigrana, and successfully re-imagined them to suit post-war tastes. Widely exhibited and praised during the 50s and 60s, series such as Merletto, Composizione Lattimo and Petali Filigranti stand as testament to his greatness both as designer and master blower. The pieces presented in this collection represent Archimede Seguso at his best: they exhibit an amazing technical virtuosity coupled with a refined sensibility of form and design which even today seem fresh and contemporary. Considered by many to be one of the greatest glass blowers of the 20th century, Archimede Seguso’s creativity and technical mastery continue to inspire and amaze.